We’re pleased to announce that two books with medieval themes written by Exeter academics have been shortlisted for the 2019 Current Archaeology Awards, in the ‘Book of the Year’ category – see here. Nick Holder (Honorary Research Fellow, History, and English Heritage) has The Friaries of Medieval London, a survey of these important religious houses; Professor Stephen Rippon (Archaeology) has Kingdom, Civitas and County, an examination of the longue durée of British landscape. Do have a look at the eight nominations and perhaps vote for one of the two Exeter books, or for one of the other excellent books on the shortlist. Voting closes on 11 February 2019 so don’t delay! For some years now St Nicholas’ Priory, in the area of Exeter off Fore Street known as ‘the Mint’, has been closed to the public. However, conservation work continues and plans to reopen at least parts of the priory are afoot. The building is managed by Exeter Historic Buildings Trust (EHBT) and I recently met with the Trust’s representative, Lesley Lake, to discuss the priory’s history and its future. The priory’s history goes back to shortly after the Norman Conquest. 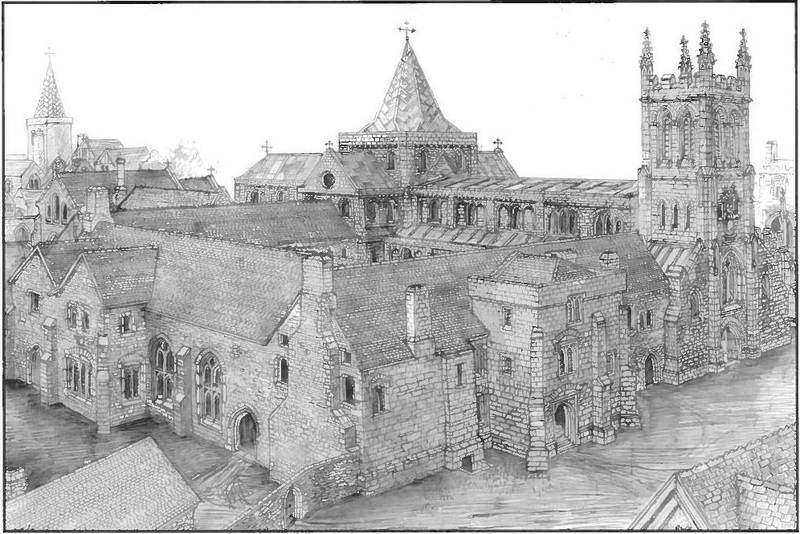 Gytha, Harold Godwinson’s mother, owned numerous properties in Exeter including St Olave’s Church; after the newly crowned King William defeated a rebellion by the city of Exeter in 1068, he gifted the church to Battle Abbey. In 1087 the monks from Battle who had been sent to take over the abbey’s new property decided to establish a Benedictine priory nearby as a sister house of Battle and dedicated it to St Nicholas. Over the following centuries the priory expanded, with most of what remains today dating from the fifteenth century. Along with many other similar sites, much of St Nicholas’ was torn down following the Dissolution in 1536, leaving only the northern and western ranges standing. An amusing account survives describing how several local Exeter women attacked the workmen who came to dismantle the rood screen within the church, chasing one up the tower and forcing him to leap out of a window to safety. In spite of (or, rather, because of) their religious fervour the women were arrested and the remaining buildings were sold off. Eventually the priory was purchased by Robert Mallet in 1562, whose family leased the property for the next two centuries and converted part of the buildings into a mansion. During the mid-seventeenth century it was divided into two separate dwellings and Mint Lane was created, though it was not until 1864 that the dwelling over the lane connecting the two ranges was pulled down to widen the lane to the size it is today. In 1820 the Wilcocks purchased the building known as the ‘Priory’ and converted it into five premises for rent – the property was eventually sold to Exeter Corporation in 1912 and opened as a museum in 1916. Meanwhile, in 1775 the Roman Catholic Mission moved into a tenancy in another part of the extant buildings, the ‘Refectory’. Eleven years later, Lord Hugh Clifford of Chudleigh purchased the buildings for their permanent use, leading to the construction of the Roman Catholic church in 1788 and the Roman Catholic school of St. Nicholas in 1855. By 1959 the church and school had left the premises and in 1991 the Roman Catholic Diocesan Trust put the buildings on the market. In 1995 Carol Griffiths came across the empty and decaying Refectory and set about its restoration, founding the EHBT in 1996 and securing the lease of the property in 1998. Today, the priory complex remains divided into these two sites: the ‘Priory’ or ‘St Nicholas’ Priory’ to the west; and the ‘Refectory’ at 21 The Mint to the north. ‘St Nicholas’ Priory’ is a Grade 1 listed building and is owned by Exeter City Council. 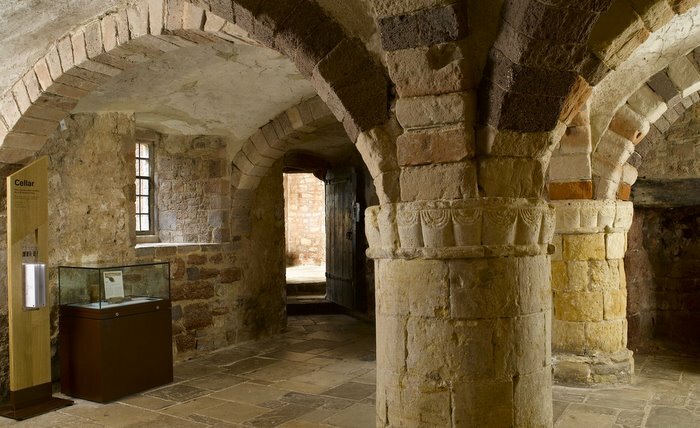 It includes the Prior’s chambers, guest chambers, kitchen, a Norman cellar, and retains an original plaster ceiling – most of these rooms have been restored to resemble a Tudor dwelling. The Refectory is a Grade 2* listed building and is leased by the EHBT from the Roman Catholic Diocese of Plymouth. The eighteenth-century Catholic church and the nineteenth-century school buildings are still extant and stand on the site of the chapter house and priory church, with a walled garden replacing what was once the roofed cloister. During the mid-seventeenth century the Refectory was sub-divided into several storeys and now contains the Refectory on the top floor, a flat, and a three bedroom house. Both the flat and the house are currently occupied and are the only income stream the EHBT have for the property outside of donations. 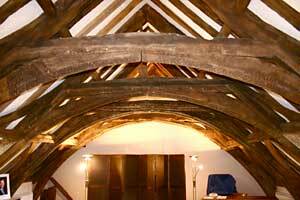 The medieval roof timbers in the Refectory are particularly impressive and come from trees that were felled between 1439 and 1453. The conservation of both sites has proved challenging. 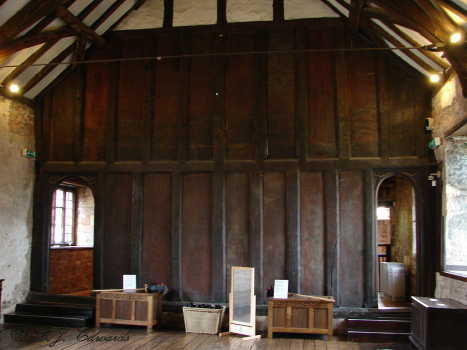 Squatters took over the Refectory in 1999 and stripped a Georgian cupboard of its panels for firewood. A little later, the refurbishment of roof was interrupted when the initial contractors went bankrupt – leaving the work unfinished and the medieval roof protected by only tarpaulins. The current closure of the Priory has been caused by significant structural problems, in part thanks to a large and heavy oak screen from the fifteenth century whose weight has been bearing down on the Norman cellar beneath. This problem is currently being solved by suspending the oak screen from a steel arch above, which is also designed to fortify the walls. In spite of these setbacks the EHBT and the Council have resolutely continued with their restorations. Of course, such hard work requires funds and, according to the EHBT, a total of £819,000 has been raised so far, much of which represents the award of Heritage Lottery Fund money for the project. Although there is still plenty of work to be done and many organisational matters to resolve, enough should be completed for the Priory to open to the public for the Heritage Open Days festival in September. Parts of the site should also be open on 22 and 23 July, while on 21 July a special reception is planned for organisations who would potentially like to use this space for exhibitions, theatrical performance, or even ghost-hunting! If you have an event and would like to make use of this space, then you should contact EHBT via enquiries@ehbt.org.uk – Lesley and the members of the trust will be very happy to hear from you! Hopefully, there will soon be plenty of diverse events to attend within these two fascinating buildings.